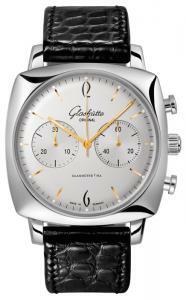 The design of the Glashütte Original Senator Sixties collection clearly reflects the joie de vivre of the 1960s. Above all, the aesthetic attitudes of this era found their expression in geometric forms, which were used as stylistic elements in the fields of art, fashion, and design. 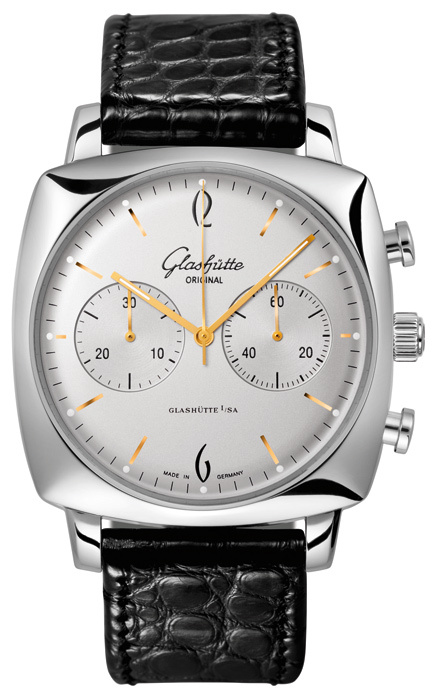 The squared cushion shape was a popular design form in the 1960s, inspiring the creative heads at Glashütte Original to design the recent Senator Sixties Square Chronograph. The distinctive edges of the stainless steel case provide the perfect frame for its elegant dial, creating a fluid transition from the round center of time to the angular design of the case. The convex sapphire crystal, antireflective on both sides, gives an unobstructed view of the domed dial. Domed, skeletonized hands glide harmoniously across the satin-finished background of the dial, featuring diamond-cut hour markers fitted with typical SuperLumiNova dots and an extravagant numeral font reflecting designs typical of those years. The 42 mm case provides a perfect frame for the balanced dial upon which Glashütte Original’s designers have also positioned the totalizers at 3 and 9 o’clock. With the aid of rounded buttons located on the side of the case, the wearer can easily operate the start, stop, and reset functions of this stylish chronograph. 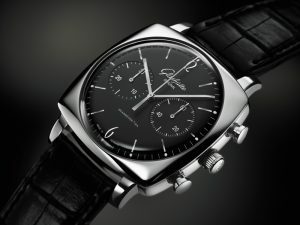 The shaped sapphire crystal first used on the Senator Sixties models is naturally also present on the Senator Sixties Square Chronograph. 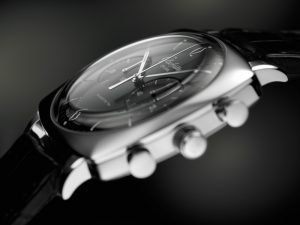 It provides not only a sensational view of automatic manufacture Caliber 39-34 with its with typical Glashütte design features such as the three-quarter plate, swan-neck fine adjustment, Glashütte ribbing and double sunburst decoration, but also allows a rare side view of its revolving 21-karat gold rotor. The retro look of the Senator Sixties Square Chronograph is also apparent in the fine Louisiana alligator skin strap. The stainless steel model is available in two versions: a classic and harmonious combination of silver-colored dial with rose-gold hands and appliqués and a timeless black variation set off by silver-colored hands and markers.